Thanks. Do you have a source to buy them from? My search skills aren't strong enough apparently. '15 model year. Last edited by Fly-Sig; 10-27-2015 at 06:19 PM. Last edited by kawdog; 10-27-2015 at 11:10 PM. Found several responses but only for 2007 - 2014 Versys. You could perhaps contact for 2015 availability. Where are you pricing the H&B bars? I just paid $225 for mine from Moto Machines and I got them 17 hours after ordering since I live nearby. The RD Moto bars on eBay are cheaper but with a $75 shipping charge they come to $265. I have a bad memory or I got ripped off. Crash bars are a rush item when I get a new bike, so I always just go for HB usually, with radiator protection. In 5 hours after installation, that and my rear SW rack saved me a bundle, so I didn't get ripped too much though. But I don't usually check more than an afternoon on crash bars and dual horns after I get a new bike: or check more than an hour or two really. Last edited by kawdog; 10-28-2015 at 01:57 PM. 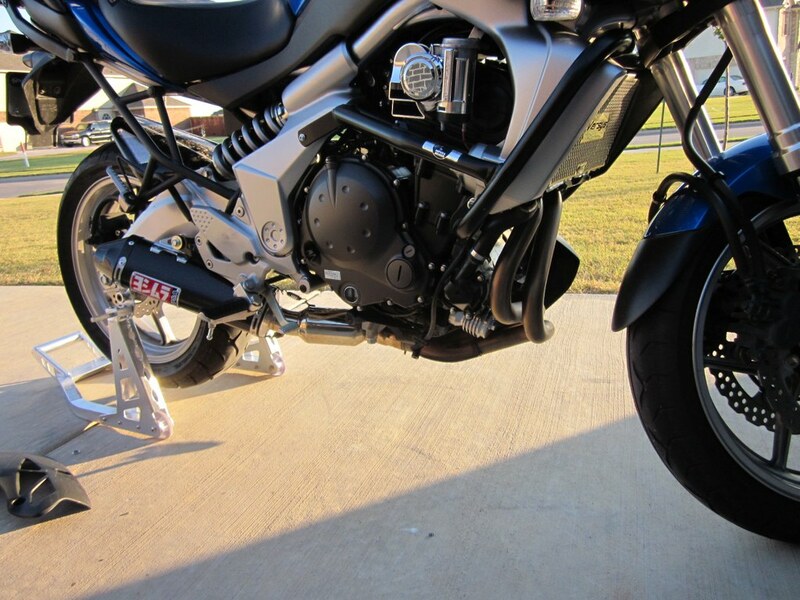 I'm seriously thinking about frame sliders instead of crash bars. Nothing in either category looks like it will protect the turn signals, which means any tip or slide is going to take out at least the one black piece of plastic cowling. $200. Dimotiv makes an interesting frame slider which does stick out enough that only the foot peg and handle bar end will touch the ground, plus the turn signal. Puig's frame slider looks like it does the same thing. I have SW Motech lower and Pro Moto upper on mine. Been down on a soft verge when off road and they did their job. I'm personally torn between the SW-Motech (Sturdy, tested, and flow nicely with the lines of the bike) and the Dimotiv (Beefy, stick out further, look OK). Personally, I feel that nothing will protect your legs better than some armored pants. It doesn't have to be a race suit either. Cyclegear sells a set of Street & Steel jeans with the CE armor in them. I have a pair, and they fit nice, and the protection is beefy. Nothing in either category looks like it will protect the turn signals, which means any tip or slide is going to take out at least the one black piece of plastic cowling. $200. That's why I personally treat crash bars and frame sliders as devices that should protect the critical parts of the bike so that you can limp back home if you drop it, not as insurance for broken plastics. I have ordinary insurance for that. I'm a big fan of the Hepco Becker Crash Bars. I got hit by a car direct hit to the right side crash bar. Saved me and the bike a lot of damage, Just had to hit the scrapes on the bars with some touch up paint. I'm looking for a set of crash bars for my 2015 V 650 and I've basically found three based on the recommendations of this thread and others. The aftermarket is still catching up and there isn't the wide field of products to choose from. This is what I've found, images included. I really want to like the SW-Motech Crash frames because they are available from reputable dealers (Twisted-Throttle, RevZilla, etc.) but they don't seem to cover as many parts as the other two products. I have no idea if anyone stateside carries the Dimotiv bars and the RDMoto are mostly on fleaBay. I'm new to the motorcycle thing as this is my first bike and I've had it all of 2 months, so I would really like to hear what you more experienced riders think. 2015 Versys 650 ABS "Kermit"
I saw an advert. for a crash-bar (out of Thailand) selling for around $169. Looks like the SW-Motech one w/ added protection. Can't find the advert right now. Last edited by fasteddiecopeman; 01-14-2016 at 02:15 PM. What is your purpose and main use for the motorcycle? I've found that the foot pegs and handlebar ends are what hit the pavement, along with the front turn signal. Luggage, too, if it is mounted. A frame slider or the SW-Motech would probably be enough protection for a basic slide on pavement. There are some frame sliders out there which look pretty sturdy. Plus axle sliders seem to make sense on the front. On dirt or uneven surfaces, something could penetrate the plane formed by the foot pegs and handlebars. Then you would want more comprehensive protection. The Dimotiv looks like it would give a lot better protection than the SW-Motech, though I personally don't like how they stick out. But that's just my personal dislike of the aesthetics. Since I will be doing some dirt and light adventure riding, I'll be going with the RDMoto unless a domestic source comes out with something similar before springtime. I used to have the SW-Motech bars mounted on my Mk3 2015 but I found them a bit too minimalist for my liking and the type of roads that I ride on. So I changed for the Hepco & Becker Bars which seem to provide more protection. At the same time I added the Hepco & Becker bash plate. I now feel more comfortable and have a place to hang the driving lights. Weekend leisure riding. Gets me out of the house. I don't plan on any dirt riding anytime soon, but I didn't say "never". As stated earlier, I'm new, so I don't plan on going aggressive without a lot more time in the seat. But, I've been prone to the "red mist" on occasion. That is a fine trait to have, can never be too honest.